A Chinese adviser recently suggested that Beijing should rein in Hong Kong’s education sector because it helped foster the pro-democracy Umbrella protests. Chen Zuo-er, the chairman of the Chinese Association of Hong Kong and Macau Studies, said in a forum hosted by the semi-official think-tank on Thursday that Hong Kong must consider the Chinese regime’s “national interests” in coming up with education policies. “Why was the education sector in such a mess during Occupy Central? How have the young men, who were just babies at the handover, become those on the front line who brandished the UK national flag and stormed into our military camps and government?” said Chen. “Many people have a distinct lack of national democratic and civic awareness, life goals, and knowledge in geography, history and culture,” he added. Thus, Chen says, Hong Kong’s youths have been “brainwashed” into joining the nearly three-month long street occupation and the pro-democracy Umbrella Movement. Chen also said that the Asian financial hub’s top education official is subject to “supervision of the central government,” citing articles 48 and 104 of the Basic Law, Hong Kong’s mini constitution. A product of the 1984 Sino-British Joint Declaration, the Basic Law dictates how Hong Kong, who was granted a “high degree of autonomy” for a period of fifty years after rejoining China in 1997, will rule itself under the “one country, two systems” model. 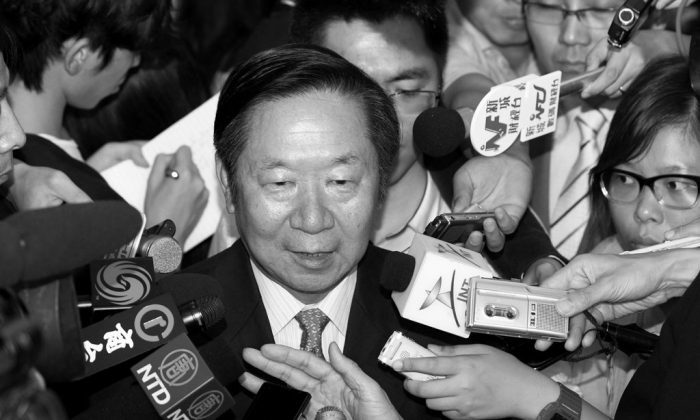 Chen’s comments was quickly criticized by a number of figures in Hong Kong’s education sector. Lawmaker Ip Kin-yuen, who represents the Hong Kong Professional Teachers’ Union in the legislature, argues that education is an area outside Beijing’s direct control, citing clauses 136 and 137 of the Basic Law. Ip says that the education secretary answers only to the city’s top leader and to no one else. Moreover, Hong Kong’s youths have become less “patriotic” towards China in recent times not because of a failure or gap in Hong Kong’s education system, but because of social changes in China and news from the Internet, Ip adds. Cheung Yui-fa, a Liberal Studies teacher at a local school, says that Hong Kong students will be further alienated from the local government and the Chinese regime if Beijing insists on forcing through “brainwashing” national education classes. The Hong Kong government and Chinese regime have tried to instil “patriotism” in Hong Kong’s schools earlier, albeit unsuccessfully. In 2012, tens of thousands of Hongkongers took to the streets to protest a proposed “moral and national education”—contemporary Chinese history heavily laced with Chinese nationalism and a pro-Chinese Communist Party bias—curriculum. After weeks of demonstrations, hunger strikes, and an occupation of the government office grounds, hugely unpopular Chief Executive Leung Chun-ying backed down and gave schools the option of adopting the curriculum for a three-year “trial period” before deciding if it will be made mandatory in 2015. Teenage student leader Joshua Wong—the 2014 Umbrella Movement’s most famous protester face—rose to prominence during the 2012 protests, and has a witty comeback to Chen Zuo-er’s proposal to impose “national education” on Hongkongers again and exert Beijing’s authority over the city’s education sector. “Frankly, without the ‘moral and national education’ curriculum proposal, ‘Joshua Wong’ won’t be who he is today,” said Wong, according to Apple Daily.